With the strum of a guitar and the pound of drumsticks, junior Paul Nameth’s annual Battle of the Bands will come again in early 2019. At the beginning of 2018, Nameth created a project that embodied his passions while also championing a good cause. He reached out to the Donna E. Shalala Music Reach program at the FROST School of Music at the University of Miami. Music Reach encourages and nurtures musical development in all students. After coordinating with the head of the program, Dr. Melissa Lesniak, Nameth began preparing his event, and was able to raise nearly $1000 for the charity. 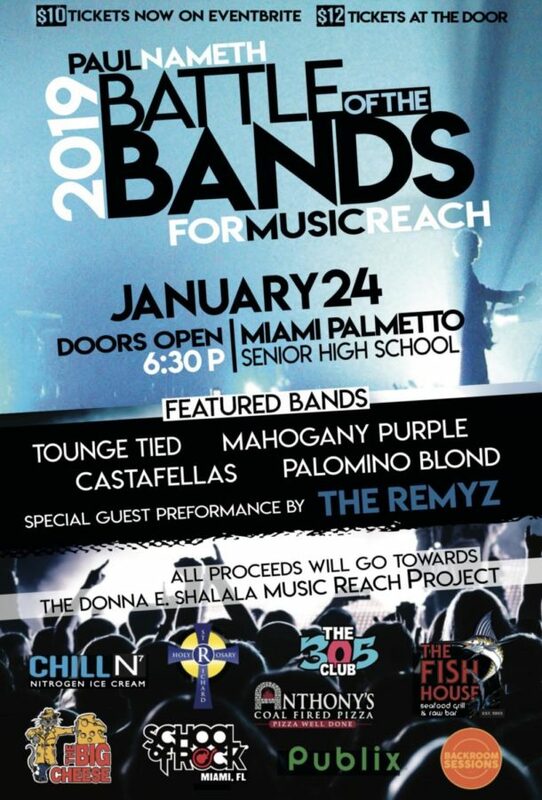 Not only does Battle of the Bands focus on donating to Music Reach, Nameth wants to promote local bands. Through Nameth’s own band, PEAR, he was able to connect with several other bands. This year’s setlist includes Tongue Tied, Castafellas, Mahogany Purple, Palomino Blond and a special guest performance from The Remyz, who are Palmetto graduates, which will all have around 20 minute sets. “It’s a really good way for people to get into the scene and be able to follow the bands that they might enjoy,” Nameth said. The bands will be scored by a variety of judges with musical backgrounds. The event also received many more sponsors since last year, including the 305 Club, School of Rock and Holy Rosary. As well as sponsors, the event will include raffles, including a $100 Anthony’s Pizza card. Nameth hopes the crowd will have a good time and enjoy the local musical talent.